Lakefront has good design and good beer, but needs more marketing to grow beyond the region. d I studied humanities.) Both of us stumbled into internships with tough-minded entrepreneurs (I with experienced newspaper publisher Marti Buscaglia and Matt with Milwaukee beer maven Russ Klisch). And as the recession raged on we both earned our stripes. I was pulling together calendar events and tabulating survey results while getting into better and better magazines, Matt was working in production and filling up kegs in while doing more and more marketing work for Lakefront Brewery. Now he’s the sales and marketing support for Lakefront Brewery, meaning he does much of the day-to-day marketing work. Lakefront is a 46,000 barrel a year company with a reputation for creative but consistent beers (especially their gluten-free New Grist) and an entertaining brewery tour. In addition to a large following locally, Lakefront exports to South Korea, Ukraine, and military bases in Japan,. The company also hopes to get its beer into China. Here’s what I learned from the company’s current marketing efforts. Like a lot of breweries, Lakefront has a bootstrap ethos. They have a brand manager and a director of business, but except for Instagram and international outreach, Matt does the creative work himself. “I write all the copy for our sell sheets and for what goes on the web site,” Matt says. Furthermore, Matt runs social media and does in-house graphics—all without a team under him. 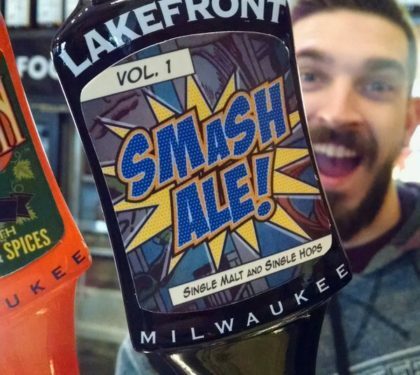 Lakefront works on some campaigns with Milwaukee based Traction Factory but for a company of its size that’s a pretty lean marketing department. Because the craft beer market is so saturated right now, I see some danger in this approach. I think craft brewers tend to underinvest in campaigns, which leaves them vulnerable to competition from marketing-savvy rivals—in Lakefront’s case that would be New Glarus, Revolution, and Central Waters. Quality should be enough to get ahead, but people have short attention spans and need to hear about your product in the first place before they’ll know to try it. Lakefront is definitely a local favorite in Milwaukee. The media knows them, local beer drinkers love the product, and people from out of town stop by for the tours. The trouble is stretching that reputation beyond the cozy confines of the city to the US at large. Matt says he wishes he had “more time” to build rapport with regional or national journalists in the beer space. Google News shows that of the many stories written about Lakefront in the past year nearly all are extremely local to Milwaukee. The answers might surprise you. You probably won’t take all the ideas, but it’s likely you could incorporate one or two of the new initiatives and get a great ROI. Matt, for example, said with more time he’d monitor media and social media to see what people are currently saying. It’s a lot easier to evaluate someone on what they produce (graphics created, descriptions written) rather than on what they hear (customer feedback), but ultimately listening and understanding the customer is far more powerful for a brand’s growth. Matt suggested creating videos of day-to-day behind the scenes work like beer being packaged, which is a good idea for a medium like Facebook. As I mentioned before, he also talked about having time to engage national and regional reporters. I often hear people say “we just want a story”, but stories take time to develop and you have to build a network before you need it or the pitching comes across as forced and inauthentic. Based on what I’ve seen from Lakefront I think they’re a polished company with a good sense of humor, and with some additional marketing could definitely increase their market share outside of Milwaukee.